You’ve heard that olive oil is best for health. But is it also best for all different cooking methods? And what about when you want a subtler flavor? You may be surprised to learn that there are other tasty and nutritious choices. I’m not saying it’s time to ditch your olive oil, but rather to add some pizzazz to your pantry. These four oils deserve shelf space for their versatility as well as their health benefits. 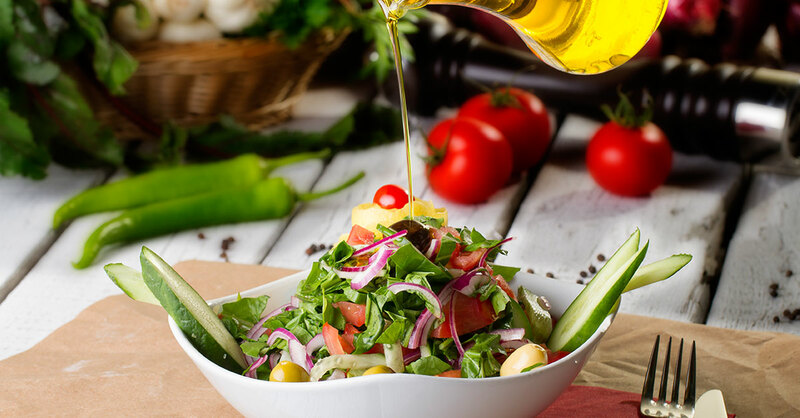 Note: Healthy oils play an important role in satiety and flavor of food, but are still calorie-dense, so portion control counts. Aim for a daily total of one to two tablespoons and maximize their nutritional impact by using a variety of oils. Pressed from creamy avocados just as olive oil is pressed from olives, avocado oil stands out because of its slightly buttery flavor—great for smoothies, sauces and baked goods. It’s also a top choice for high-heat cooking. That’s because it has the highest smoke point of all oils, at 520°F. Smoke point is the temperature an oil can withstand before breaking down. Oil heated beyond its smoke point loses nutritional value and may create harmful carcinogens. (As a point of reference, generic olive oil in general has a medium smoke point of 320°F, which makes it best for sautéing and cooking at low heat. Extra-virgin olive oil’s smoke point, however, is higher at 405°F.) Choose avocado oil for high-heat cooking methods like searing, roasting, barbecuing and frying and for marinating foods that will be cooked on a hot grill. Health benefits: Avocado oil is high in healthy monounsaturated fats, especially oleic acid. These improve blood cholesterol levels, which can reduce the risk of heart disease. Avocado oil’s anti-inflammatory nutrients may also help ease inflammation, joint pain and stiffness from arthritis. A lab study done at the University of Veracruz in Mexico found that avocado oil can also lower LDL cholesterol. A staple of Asian cooking, sesame oil, pressed from sesame seeds, is very versatile. Just read labels carefully. “Pure” sesame oil has a light, nutty flavor and, with a medium-high smoke point of 350°F, can be used for light sautéing. “Toasted” sesame oil, on the other hand, has a very bold taste and is used as a seasoning, not as a cooking oil, to complement the flavors of Indian, African and Asian dishes. For freshness, store both types in the fridge. Health benefits: Sesame oil is equally rich in polyunsaturated and monounsaturated fats. It can promote heart health by decreasing LDL cholesterol, according to a report from the University of Central Florida College of Medicine published in the journal Cureus, although the ideal amount to have in your diet is not yet known. Various studies have found that using sesame oil can reduce high blood pressure and/or the amount of medication needed to control it. One in particular, done at the Aarupadai Veedu Institute of Technology in Tamilnadu, India, published in Yale Journal of Biology and Medicine, found that when participants with high blood pressure used only sesame oil—2.5 tablespoons a day for a period of 45 days—their blood pressure levels lowered to normal (a better result than achieved with their medication alone, which they continued to take during the study). Flaxseed oil has a smooth and slightly nutty taste…as long as it’s fresh. It’s one of the most delicate oils and spoils quickly, so it should be stored in a dark, airtight container in the refrigerator. With a very low smoke point of 225°F, it’s most suitable for cold preparations such as salad dressings and dips or as an addition to smoothies and precooked foods. Flaxseed oil is the best vegetarian source of alpha-linolenic acid (ALA), one of the omega-3 fats known for improving cholesterol levels, lowering triglyceride levels and blood pressure, reducing inflammation and decreasing the risk of certain types of cancer. (Fatty fish contain the other omega-3s—EPA and DHA.) Just one tablespoon provides at least four times the daily recommended amount of ALA.
Health benefits: Flaxseed has been used for centuries and across many cultures for therapeutic purposes. Today, much flaxseed research is centered on cancer benefits. In one large-scale study done at the University of Toronto in Canada, published in Cancer Causes & Control, women who reported eating more flaxseed had a significantly lower risk of breast cancer than women who did not regularly consume it. A multicenter study done in the US and published in Cancer Epidemiology, Biomarkers & Prevention found that men with prostate cancer who took flaxseed supplements had significantly lower rates of cancer cell growth than those who followed their usual diet or a low-fat diet. Additional testing could lead to using flaxseed as a preventive or as a complementary therapy for prostate cancer. Walnuts are one of the healthiest foods on earth, so it’s no surprise that walnut oil is a nutritious choice, too. Unrefined walnut oil has a medium smoke point of 320°F. It becomes slightly bitter when heated, so use it for salad dressings or for adding flavor to cooked pasta, poultry, fish or even smoothies. It’s another excellent source of ALA—one tablespoon provides the recommended daily amount. Health benefits: Penn State University researchers found that walnut oil can help reduce cardiovascular stress. According to the results, published in Journal of the American College of Nutrition, healthy men and women who substituted 1.3 ounces of walnuts and one tablespoon of walnut oil for other fats in their diets for six weeks had lower resting blood pressure and lower stress-induced blood pressure than those who ate a more typical American diet, despite their calorie intakes being equal. As with other foods high in omega-3s, walnut oil may have a role in fighting cancer. One promising finding from researchers at Harvard Medical School and Marmara University in Istanbul, Turkey and published in Clinical Nutrition suggests that it can limit tumor growth and the spread of esophageal cancer. Look for cold-pressed or unrefined oils. While more expensive, this method extracts oil by putting the fruits or seeds through a press. Refined oils are usually processed with chemicals and undergo bleaching and/or deodorizing. Any oils not stored in the fridge should be kept in a dark cabinet, away from heat. Always let refrigerated oils come to room temperature before using.